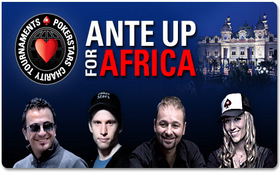 We expect to see poker celebrities at the poker tables at the Rio during the WSOP, but there is one tournament that attracts a number of celebrities that have only a passing interest in poker, the $5,000 Ante Up For Africa charity poker tournament –actually the WSOP Main Event also draws a considerable number of celebrity players. In the end it was Phil Gordon who edged out Shannon Elizabeth for the title. Even though a large portion of the prize-pool is already donated to charity, many of the players will also donate a portion, or all, of their winnings as well, as Gordon did for his final table appearance last year. No word yet on what the tournament raked I for the worthy charity. This entry was posted on Sunday, July 4th, 2010 at 5:58 pm and is filed under Poker News. You can follow any responses to this entry through the RSS 2.0 feed. You can leave a response, or trackback from your own site.